Are you a frequent podcast listener and Disneyland Resort fan? If so, you’ve probably heard of the outstanding EarzUp Podcast hosted by Jason Petros, Terrence Green, and Taren Howes. This hilarious trio produces fabulous live shows and podcasts about Disneyland. Their show is filled with information on how to make the most of your time at the resort from three people with years of experience enjoying the parks. I joined the gang to discuss my book A Tale of Two Resorts: Comparing Disneyland and Walt Disney World – A Traveler’s Reference and give them some insight on the differences between the two destinations. I had a blast talking with these guys and hope to visit their show again in the future as they plan their first trip to Walt Disney World. 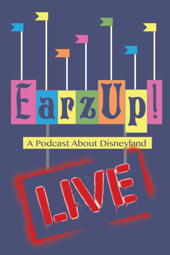 You can head over to EarzUp! Podcast by clicking here to listen to our chat. I hope you enjoy it! Comparing Disneyland and Walt Disney World – A Traveler’s Reference! Please check out EarzUp Podcast! Please check out Jason and Taren’s Newest Venture – Covears! Do you like to listen to Disney podcasts? That was a great show and your segment was awesome!